You will feel like you are Almost Home at this newly remodeled Scottsdale vacation rental condo at Sunscape Villas. Sunscape Villas is located alongside the Continental Golf Course, which is off of Hayden Road and Indian School just three blocks from Scottsdale Road. This is a great location on the 20 mile long Scottsdale Greenbelt and exercise trail, walking distance to the Scottsdale Stadium and the San Francisco Giants Spring Training Baseball, Old Town Scottsdale, Scottsdale Fashion Square Mall, the 101 Loop Freeway, Salt River Fields at Talking Stick, the Phoenician Golf Course, Talking Stick Golf Course, Phoenix Sky Harbor International Airport, Tempe Town Lake, Chaparral Dog Park, Arizona State University, and West World. This first floor 2 bed/2 bath condo was recently remodeled, professionally designed and furnished, and sits next to the heated pool and spa. Are you coming with a group or another family and do you need another condo? The Modern Escape is a 2 bed/2 bath condo above Almost Home. The remodel included new 18” travertine flooring throughout, new paint throughout, new lights, sconces, faucets, and ceiling fans, and a new dishwasher. Using the keyless entry system to go through the front door of this poolside condo, you will enter the living room. The walls are tan and the ceilings and baseboards are bright white. Kick back on the sleeper sofa or one of the two club chairs and watch your favorite program on the flat screen TV. The media stand below the flat screen TV houses the cable box and DVD player. You will get to enjoy expanded cable TV service with movie channels at Almost Home. The coffee table sits on top of a rug. There are also two corner tables with lamps and a shelving unit. The room is tied together with artwork and accessories which make you feel like you are at the W Hotel. The sliding glass door from the living room leads to the private patio. Grill up your favorite steak or seafood on the grill and enjoy around the outdoor dining table. The patio is also a great place to watch the action at the pool. The grill is a few steps from the away from the unit. Hop on one of the two beach cruisers and take a ride into Old Town Scottsdale, to see the San Francisco Giants at Scottsdale Stadium, or along the Scottsdale Greenbelt. The Kitchen includes beautiful granite countertops, dark mahogany cabinets, black-on-black appliances, and everything you might need to entertain and cook up a meal. The Kitchen Nook includes a round table with four chairs. The basket-like dining light that hangs over the table is on a dimmer to help create a softer mood. Walk down to the end of the hall to reach the Master Bedroom. 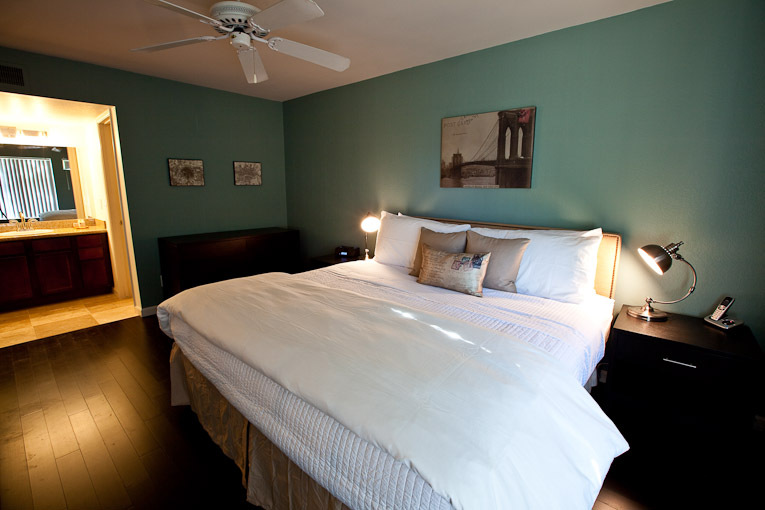 The Master Bedroom is furnished with a king size bed (Simmons BeautyRest mattress), two nightstands, a dresser, and a media cabinet. There is also a 32” flat screen TV mounted above the media stand. The media stand houses the DVD player, modem, and wireless router. The master bath vanity is open to the Master Bedroom and includes a single sink, a large vanity with plenty of cabinet space, and granite countertops. A door from the vanity leads to the shower and toilet. The shower is the length of a bathtub and is behind a sliding door. There is also a small ledge to put your things on or put your foot up in the shower. The Guest Bathroom is in the hallway and includes a single vanity with granite countertop, a single sink, a medicine cabinet for your things, a bathtub/shower combo, and a toilet. The stackable washer/dryer unit is behind the double doors in the hallway. Sunscape Villas is a great Scottsdale vacation destination with two heated pools and spas with resort-like chaise loungers, fitness center, yoga/pilates room, private cinema, clubhouse, and security guard on-site 24/7.